The great yellow bumblebee (GYBB) can be identified by its yellow or yellowish-brown colouring with a distinct band of black hairs between the wings. Its distribution in the UK has declined by 80% in the last century, making it one of the UK’s rarest bumblebees. Where once it lived throughout the UK, great yellow bumblebees are now only found in some islands of Scotland, and Caithness and Sutherland in northern mainland Scotland. The principal causes of decline are the loss of flower-rich meadows and the intensification of farming and grazing practices. With its expanses of machair habitat, wildlife-friendly land management and lack of competition from non-native insects, the Isle of Tiree is home to one of the largest populations of great yellow bumblebees in the UK, making it an important refuge nationally. But even here, the bees appear to be struggling. 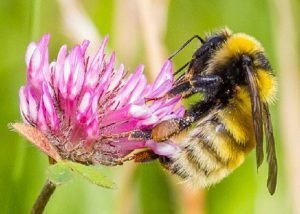 The project made a successful start on these objectives in 2017, but for our efforts to have a measurable and long-lasting effect on the survival of the great yellow bumblebee population on Tiree and, therefore, in the UK, we need to continue working on these objectives and others until at least 2020. Your help would be of enormous value to the conservation of this endangered species and greatly appreciated. 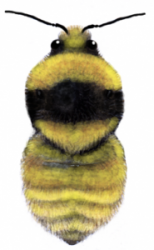 Download Tiree’s great yellow bumblebee project – booklet about the project.